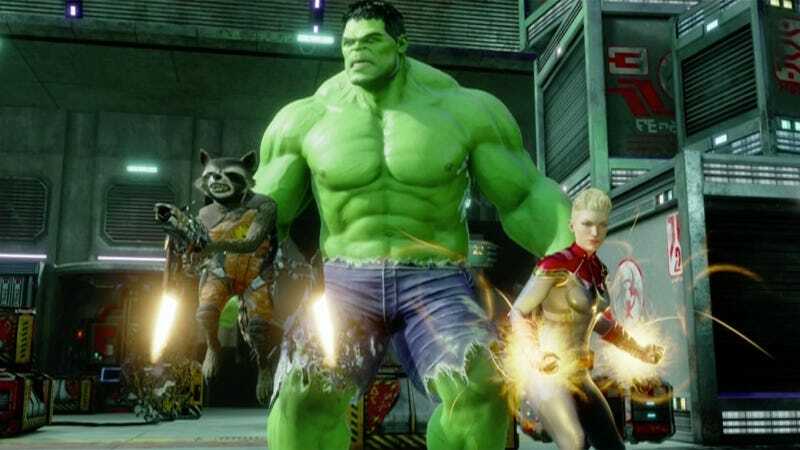 Marvel Powers United VR makes one of your wildest dreams come true. You and three friends can all team up and fight the forces of evil, in real time, as your favorite superheroes. If you and three friends all have an Oculus Rift of course. Okay so you get the gist. There’s also a fourth character, who we can’t reveal just yet, and you all play at once. You sign in with your Oculus and Lockjaw transports you and three friends into battle, to save a special artifact at the Collector’s Lair. I played through twice, once as Captain Marvel and once as Hulk, and each is radically different. As Captain Marvel, you can levitate and shoot energy beams out of your hands either from the ground or air. Hold in the triggers and you charge up for even bigger blasts or absorb a bunch of damage and take that energy and turn it around on your opponents. She’s more of a ranged, fight-from-afar type of character, where you take aim and just unleash fury. Hulk is the opposite. He’s slow, but he can grab enemies and do whatever he wants with them. Smash them into the floor? Sure. Throw them in the air? Yup. Throw them in the air and then have Rocket Raccoon shoot him? If you and your teammate coordinate. Or you can just charge up your fists and do a giant Hulk Smash by swinging your arms up over your head and down to the ground. Many of the objects in the space are similarly interactive. You can smash boxes, throw rockets, it’s all very fun. The ability to lift your arms and see the huge green fists, or awesome red gloves, is pretty special. You truly do feel like you are the characters. Waving to your teammates and giving a thumbs up for a good job adds to the fun. The main problem with Powers United though is it’s not very different from an old school arcade action game. Defeat all the enemies on a screen, move to the next screen. Defeat those enemies, move on again. Eventually you get to a boss and then you win. That’s pretty much it. Of course, more levels and characters will be added as the game rolls out and expands so, at the moment, the teams behind the game have a super solid base. I just hope they add a little more depth besides getting to the end of a level and seeing who has the most points. Marvel Powers United VR launches in 2018, click here for more info.